It’s currently 11pm on Monday and I’m eating apple crisp (already pretending it’s fall, I know) and listening to The 1975 on Pandora and feeling perfectly content. Late night writing sessions for the win! Who’s hungry? Onto the eats! Overnight steel cut oatmeal with berries, cinnamon, and this vanilla almond butter that was SHOCKINGLY delish. 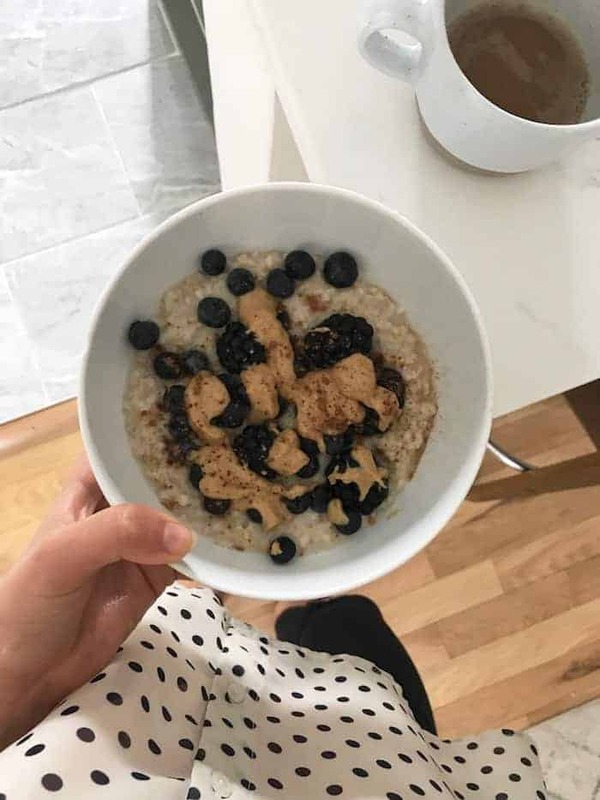 I’m actually gonna post my super simple oats method here on the blog soon! 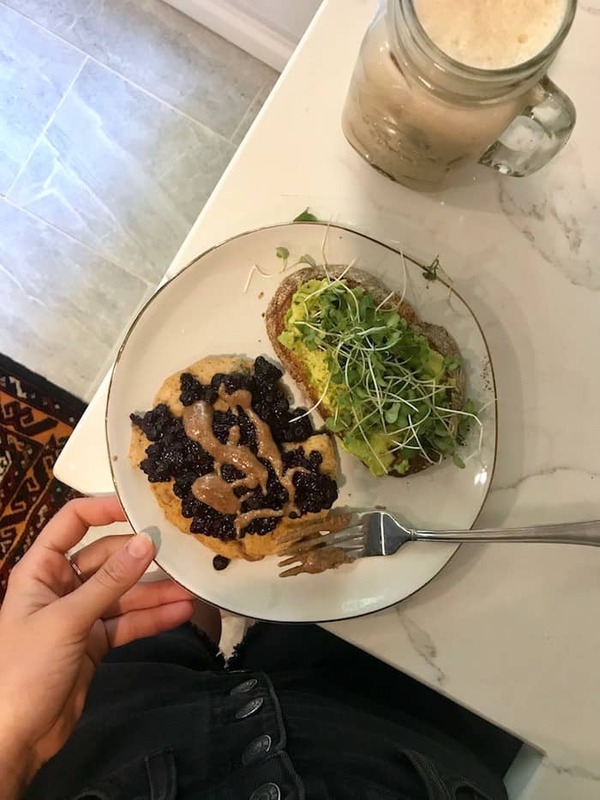 Leftover pancake (also posting the recipe soon) with blueberry chia “jam” and date pecan butter plus a piece of avocado toast on sourdough. I just got new sourdough from TJ’s and I’m excited to try it! 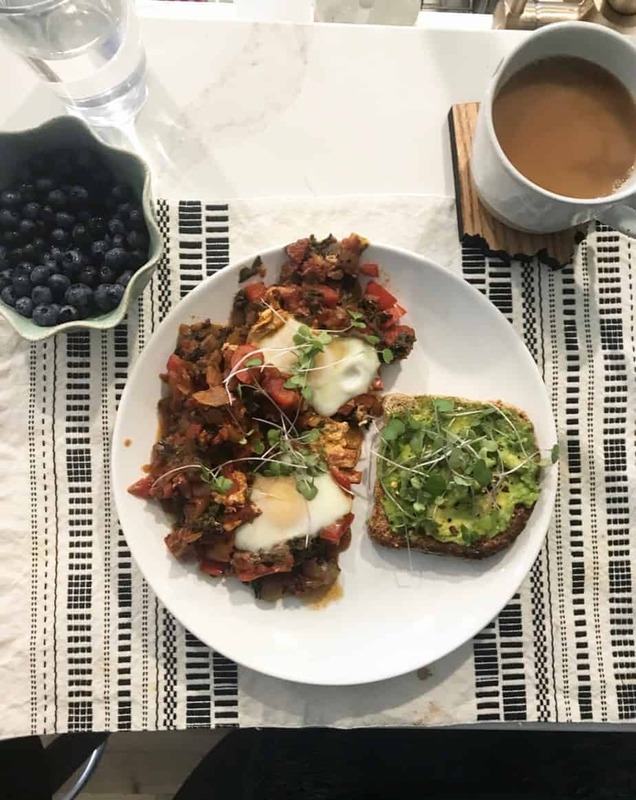 Shakshuka! So obsessed with my cast iron skillet. I didn’t have smoked paprika so I doubled up on regular. I also added a couple handfuls of chopped kale to the veggies and it was stellar. Served with avo toast instead of potatoes this time! I’ve been very obsessed with almond milk lattes. 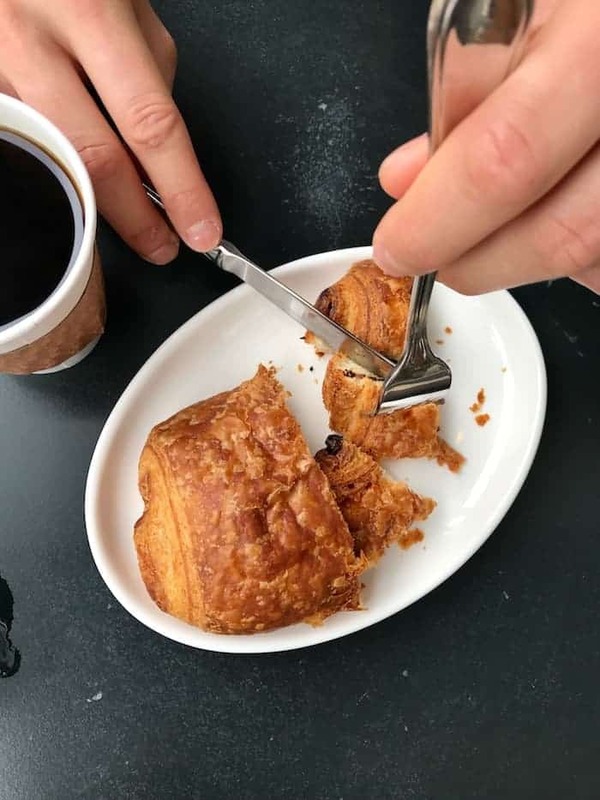 Pistacia Vera’s are the best because they use Califica Farms barista blend almond milk which is super thick and creamy. 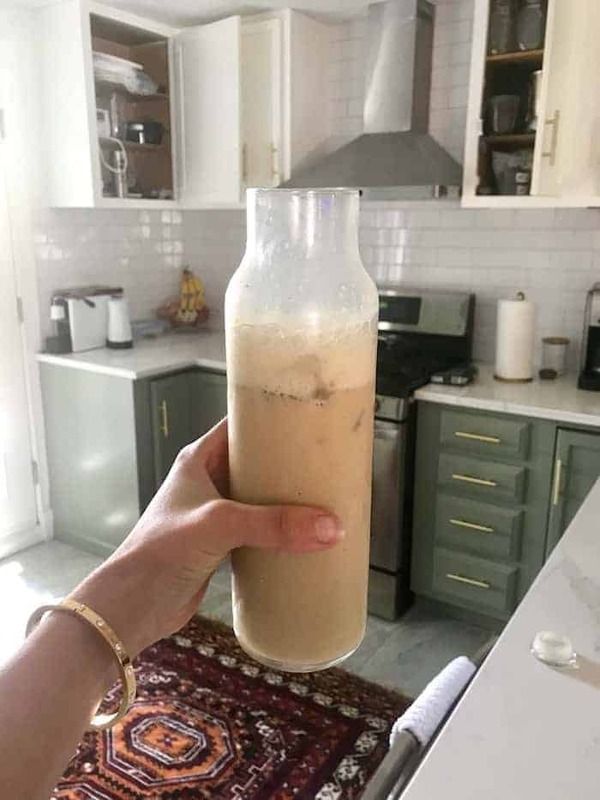 When I make them at home because I don’t feel like spending $4, I do a shot of espresso in my Espressotoria blended with 8oz almond milk, 2 tsp pure maple syrup, and a splash of vanilla. Pour it over ice and voila! 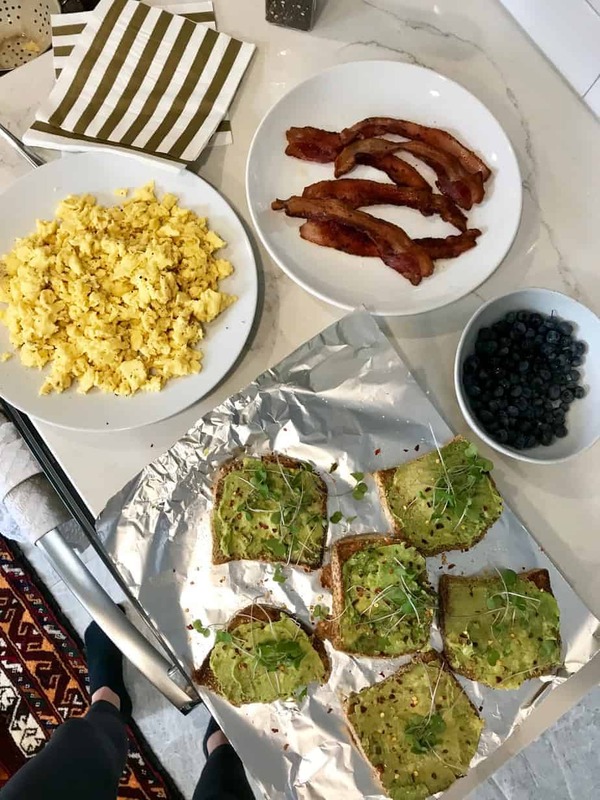 We had friends stay over Saturday night so we made a little breakfast buffet with scrambled eggs, avocado toast, berries, and coffee. Before this spread, Jeff and I split a heavenly chocolate croissant and coffee. 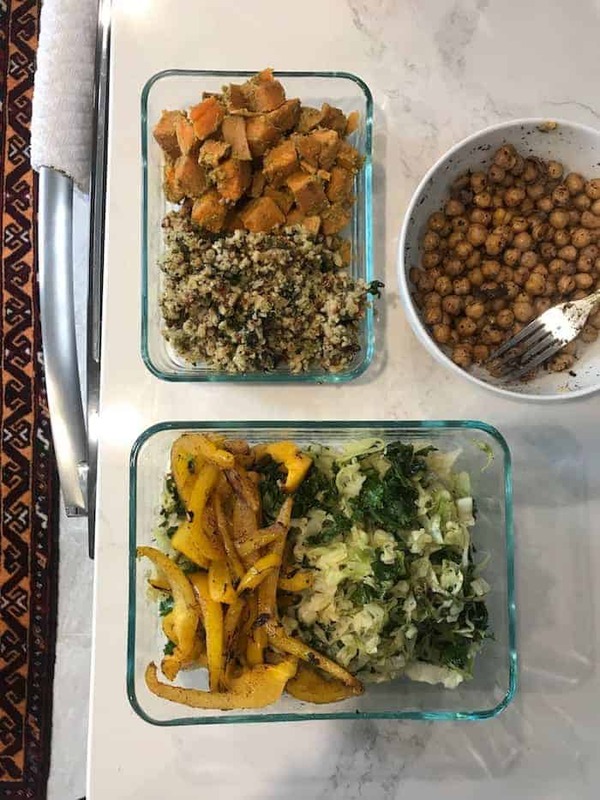 I prepped some random lunch food based on what we had in the fridge because I find for lunches I always want a big bowl of mixed flavors and textures. I try to do some kind of grain/sweet potatoes, veggies, protein, and healthy fat. First I sautéed a can of chickpeas in avocado oil with salt, garlic powder, and lemon juice for a quick protein to throw on bowls. Then I sautéed a ton of leftover cabbage and kale plus yellow bell peppers separately (gotta get that nice char!). Meanwhile, I steamed cubed sweet potatoes and then tossed ’em in tahini, za’atar, and salt. I also had random frozen pesto cauliflower rice from Daily Harvest so I warmed that up as well. 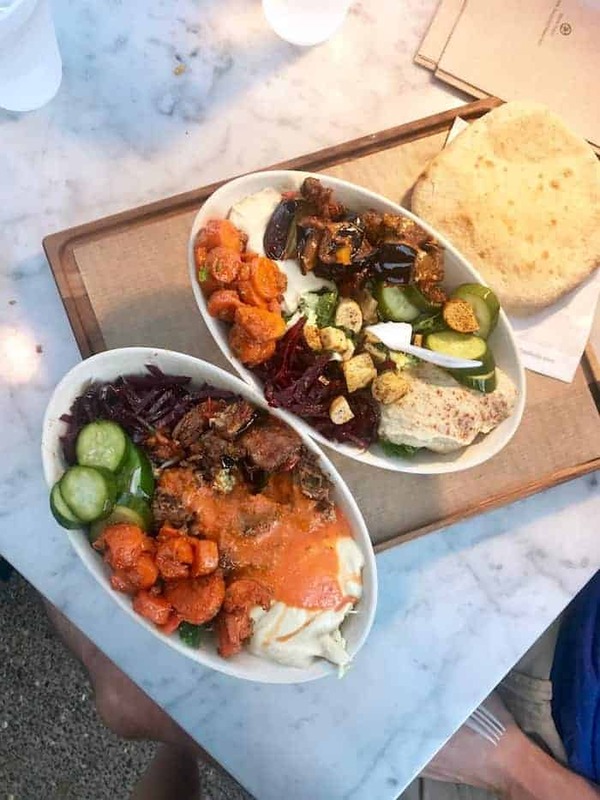 One day I ate everything with a big scoop of hummus, hot sauce, and curry kraut. 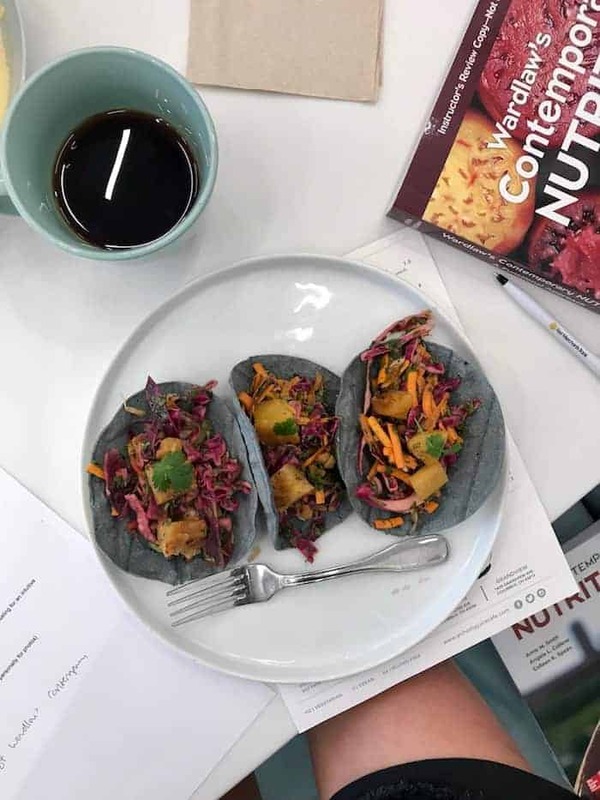 Veg Taco Trio with jackfruit at Alchemy Grandview! This was after a meeting with my professors from Ohio State about doing the photography for the next edition of the nutrition textbook. So exciting! 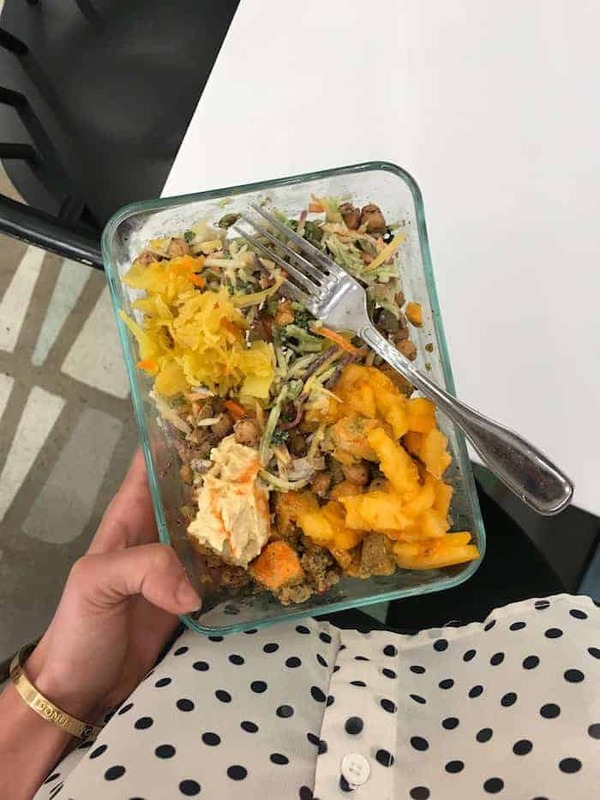 I snagged tahini, pepitas, and apricot slaw kit at Trader Joe’s for a quick throw-together salad and we loved it. I had it for lunch on Sunday with leftover roasted chickpeas and sweet potatoes. Brassica! I had lentils and rice, kale cabbage mix, roasted carrots, pickled cucumbers, hummus, baba, and pita chips. We went to the new Harvest in Bexley on Friday and LOVED IT. 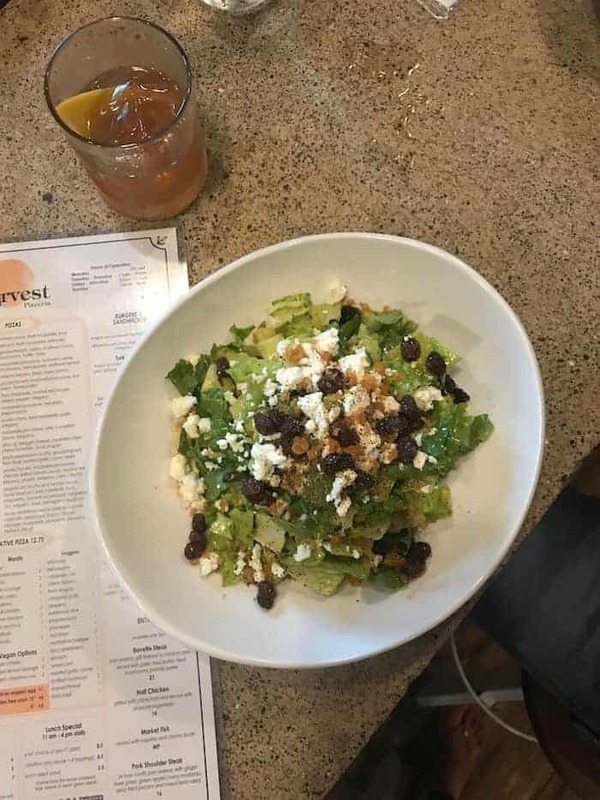 I sipped on my favorite mezcal ginger cocktail and we shared a yummy romaine salad with romanesco, feta, cukes, and pickled raisins to start. 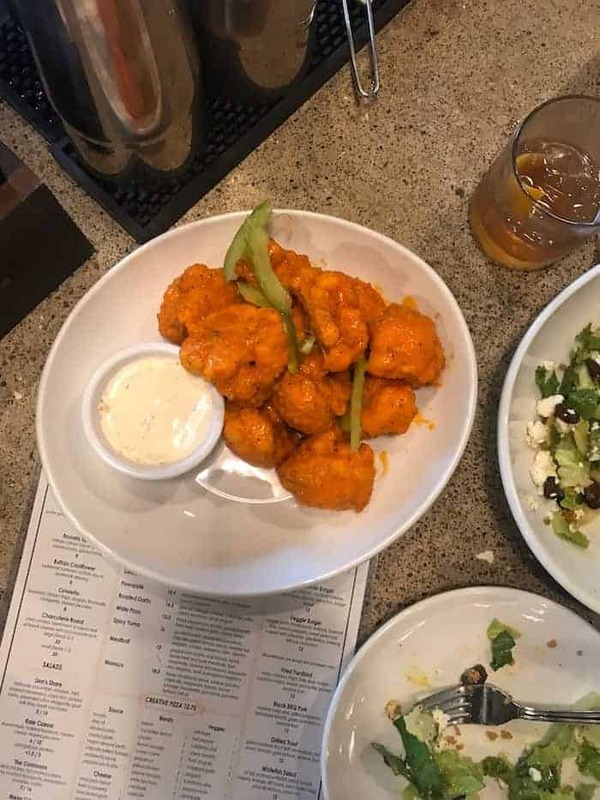 Then we tried the buffalo cauliflower which was SO satisfying. 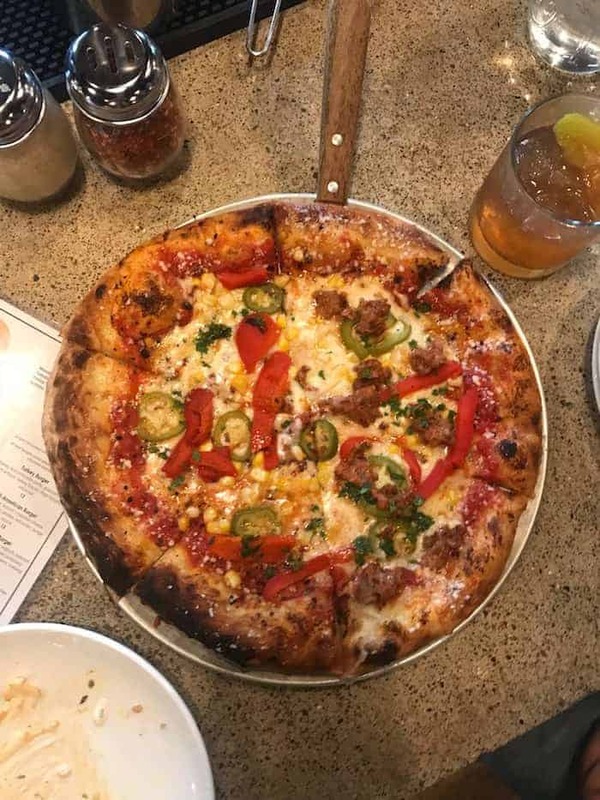 For pizza, we went with our go-to, the Spicy Yuma with sausage on half for Jeff. Sheet-Pan Mediterranean Snapper, this time using frozen wild cold from Costco and some Greek olives from TJ’s added! Stuffed Peppers with steamed local green beans tossed with a little butter, garlic powder, and salt (I had a big second helping of green beans after this pic!). I used my recipe as inspiration but didn’t measure anything and didn’t do the enchilada sauce or cashews. I also added an onion sautéed with a bunch of greens and also nooch. I’m going to repost the recipe here soon because they were AWESOME! For the sauce, I blended a handful of cashews, cilantro, water, lemon juice, salt, and garlic in the Nutribullet. Fab. Thai Crunch Salad from Northstar with herbs, mango, tortilla strips, and roasted tofu in the yummiest peanut sauce. On Saturday night we got drinks at Martini (we have a friend that works there so we get a discount) and enjoyed the calamari, tuna tar tar, and octopus apps. TRISM bowl with black rice, chipotle sweet potato hummus, roasted sweet potatoes, tofu, pickled radishes, sautéed greens, banana peppers, and herbed tahini dressing. Smoothie with frozen blueberries, frozen coffee cubes, avocado, frozen spinach, cacao, a big juicy date, vanilla extract and almond milk topped with Kashi cinnamon hearts and almond butter. A huge chocolate chip breakfast cookie from Mustard Seed. Thanks, Mom! This yummy Apple Crisp with Breyer’s vanilla. I used applesauce instead of yogurt, avocado oil instead of butter, a bit less sugar and maple because my apples were sweeter, and 2 tbsp bourbon + 2 tbsp water. We loved it! Chocolate Chip Peanut Butter Muffins. I would do 1/2 cup maple syrup next time or let my bananas get riper. I think I overcooked them, too. I also thought the amount of ground oats yielded more than the flour amount it called for. Liked but didn’t love. Homemade cucumber mint cocktails! First I blended half a cucumber with fresh mint and homemade simple syrup. I strained it and combined it with sparkling water and Tito’s vodka. Yum! Loving TJ’s dark chocolate covered almonds. Denim wrap top (runs very big, I have XXS), white jeans (half off! ), and the comfiest heels ever. Blurry pic alert! Green ripped jeans, black tank, gold pendant necklace, and my favorite black mules (half off!). Favorite jean shorts, gray tank, strappy sandals, bandana, Regan tote. Now for some workout faves! Gray leggings, tech sweat crop, tie tank. This tank is my favorite shirt ever. It’s insanely comfy and flowy, flattering, and has an option to tie in the back. I got an XS in the tank and S in the pants for reference. Pink hudson shorts and tie tank. Black slashback crop (super cute back) and gray leggings. High waisted zella black leggings, tie tank, cognac bracelet bag. They’re the worst! Lucky for me it was a delish week nonetheless :) happy Wednesday! Your lunches this week look so interesting and yummy! Hope you feel better! Love the addition of the workout outfits! Love all your OV workout outfits — so cute!! Thanks you so much friend! All of your food looks and sounds delish, and I love a good random bowl of yumminess! Your outfits as always are killer! You rock every piece, and now I really want a cute bandana to wear around my neck! So cute! Hehehe random bowls of yumminess are my JAM! 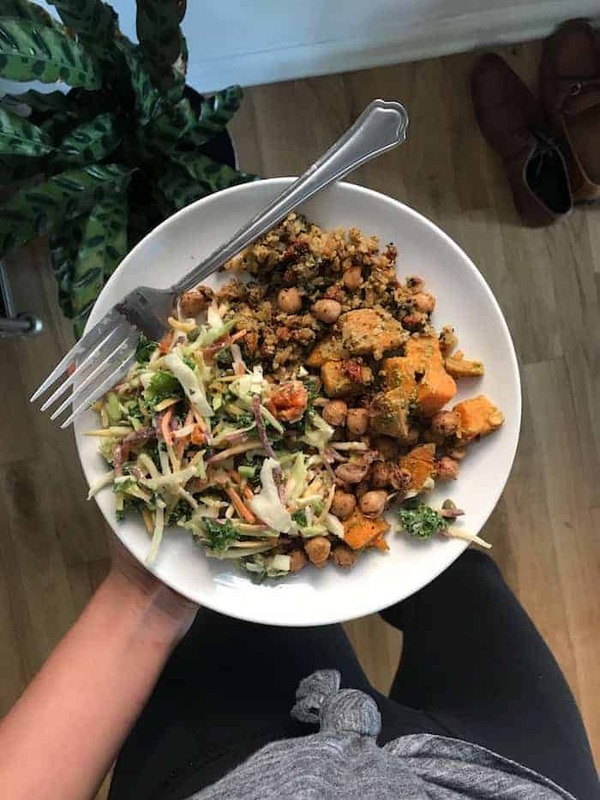 I just love all of the variety that you include in your weekly eats!! Every single meal and snack is so appealing. 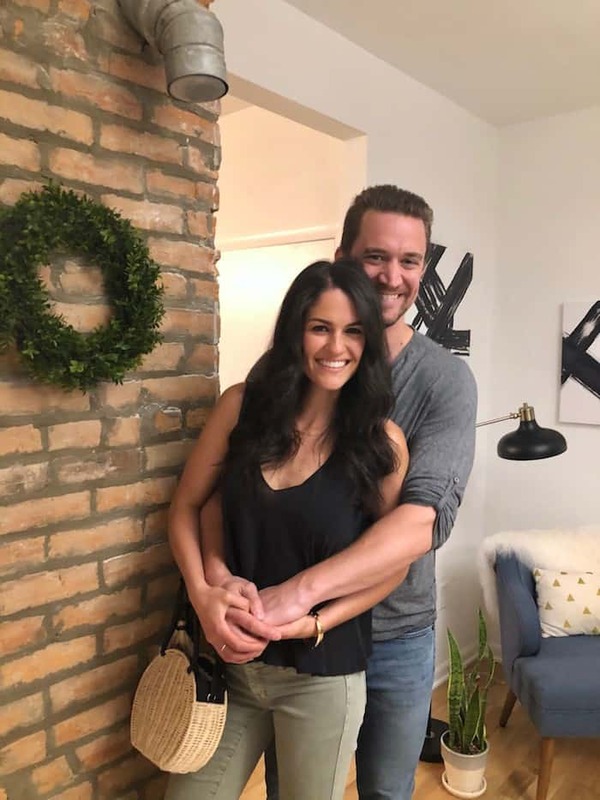 That photo of you and Jeff is adorbs! Outfits are on fire! I, like my sister Kaci, want to be able to rock a bandana around my neck! It reminds me of my favorite actress and role model of all time, Lucille Ball. She was so classy but daring in her fashion. I hope you have the greatest day! You’re so sweet, Kori! I freaking love Food so I have so much fun keeping it exciting :) have the best week doll! seriously obsessed with all of your cute outfits!!!! your dinner at brassica looked incredible and I’ll be impatiently awaiting that pancake recipe!! I look forward to this post every week!! You always inspire me to get out of my cooking rut. Also, I love that you added your workout outfits! Have a great week! Thank you so much! I feel like I’m in ruts sometimes so it’s great to hear that. I have been making pancakes with wild bloobs and maple almond butter and they are so damn satisfying! 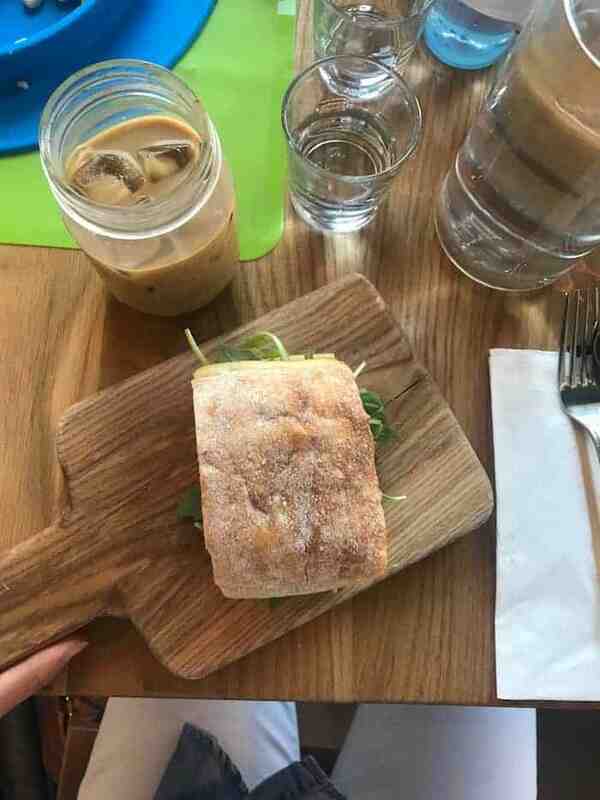 So many iced lattes around here too. I spend too much on them, but I agree that they never taste quite as delish at home ;) Oh, and whenever my muffins are less than stellar I break them in pieces, soak in almond milk and bake and then it tastes like bread pudding/baked oatmeal. Sounds weird but I love it! I love that muffin idea! Totally doing that. I love the easy throw-together plentiful meals; that’s EXACTLY what I’m craving lately. My bod doesn’t want salads but I want to take advantage of all the awesome produce out right now. You’re so good at using ingredients creatively! And I, too, am currently obsessed with iced almond milk lattes. BEST. I love all your inspiration! Question on cashew sauce: if you haven’t planned ahead to soak your cashews overnight, how do you go about making the sauces with them? When I don’t think ahead I just blend them and it’s fine :) my nutribullet does a good job and I add enough liquid so it’s not that thick. It thickens nicely in the fridge! I feel full just looking at the pictures. But I’d like some more milk lattes. Oh, late night writing is the best! I use it to blend nuts and liquid for sauces but never nuts alone. Nope, never made but butter with it—that would have to be in the food processor. Nutribullet is quick and easy for every day use! As long as you have a nutribullet and a food processor, you’ll be good to go. I have and expensive larger blender and rarely use it.